Chef Central, online at chefcentral.com, is the place to go for those of you who are chefs at heart. Chef Central offers a huge selection of bakeware, cookware, tools, cutlery, houseware, electrics, barware, and everything you need to entertain in your own home. 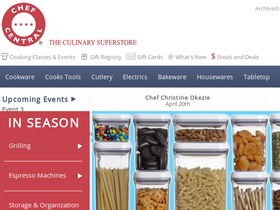 Chef Central has all the cooking and baking supplies you need. Chef Giant offers top brans including Calphalon, Wilton, Norpro, Evco, Wusthof, Progressive, Le Crueset, and so many more. So stop by Chef Central and see what they have for you but check out RetailSteal.com to find the best Chef Central coupon codes, Chef Central promotions, and Chef Central discounts. All orders are shipped via UPS ground shipping to the 48 contiguous states. Orders over $99 include free shipping. See website for full details, exclusions may apply. Save up to 70% or more on the current steals and deals at ChefCentral.com. Shop today and save on brands like Calphalon, Taylor, All Clad, Cuisinart, Wusthof-Trident, and many more. Shop at Chef Central and find specialty bakeware for prices as low as $1.99. Purchase cutlery sets starting at only $9.99 at Chef Central. At Chef Central, buy a Cuisinart Immersion Hand Blender for only $35. Click link to shop. Find blenders as low as $80 only at Chef Central. Shop at KitchenAid and enjoy 20% savings on cookware. Click here for code. Shop at KitchenAid and enjoy 15% savings on blenders. Click here for code. Enjoy a 20% discount on stand mixer attachments when you use this coupon code online on KitchenAid. Shop at KitchenAid and enjoy 20% savings on bakeware. Click here for code.